Reading is great all the time, but this month you like to be seen actually with the book in hand laughing at a funny line, shivering over a mysterious setting, or maybe even tearing up over a plot twist. Throughout the month, authors, illustrators, actors and actresses, athletes, business people, teachers, and students all upload pictures of themselves reading to encourage others to discover the joys of reading. To learn more and find resources for teachers and librarians to download and posters to order, visit the Get Caught Reading website. Copyright Emma Chichester Clark, 2016, courtesy of HarperCollins. One day when Hilda went to the grocery store, the monkeys grew bored. They opened the hall closet and “threw everything into the hall.” They opened the umbrellas, tore the laces from all the shoes, and plucked all the feathers from Hilda’s favorite hat. When Hilda came home and saw the mess she had one thing to say: “‘I’m really very disappointed in such naughty little monkeys.” Tim, Sam, and Lulu just gazed at her silently. Image copyright Emma Chichester Clark, 2016, text copyright Quentin Blake, 2016. Courtesy of HarperCollins. Needing more wool, Hilda headed into town the next day with a reminder to her monkeys to be good while she was away. But the kitchen was so enticing, and they tossed everything out of the cupboards, scattered the powdered soap, emptied the trashcan, and tipped the soup pan onto the floor. This time when Hilda got home, she became angry. “‘Great grief! How long can I put up with these terrible little monkeys?’” But Tim, Sam, and Lulu just smiled at her. Before going out the next morning, Hilda gave Tim, Sam, and Lulu a stern talking to. It was late when she returned and as she stepped through the door something seemed amiss. The living room was in perfect order, the kitchen was spotless, and the bathroom shone. Hilda broke down in tears. Something horrible must have happened to her three little monkeys. Her handkerchief was soaked through, and when she went to the closet to get a new one, she found Tim, Sam, and Lulu waiting quietly for her. Quentin Blake’s hilarious tale of three little monkeys has all the charm and style of classic storytelling that will set young readers giggling and eagerly anticipating each of Hilda’s trips into town. Adults with “little monkeys” of their own will anticipate the tenderhearted ending, and children will be delighted with the assurance of enduring love Hilda’s tears provide. A dramatic reading of Hilda’s increasing frustration with her mischievous charges will enthrall listeners as they gaze at the reader with the same sweet expression as Tim, Sam, and Lulu. Emma Chichester Clark’s sophisticated illustrations begin on the endpapers, where Hilda is leaving her elegant brownstone under the watchful gaze of her little monkeys. Tim, Sam, and Lulu are as cute as can be as they happily eat their snack and give a hint of the shenanigans to come. With each new day, the monkeys get into more and more trouble, leading to wonderful, fully detailed two-page masterpieces of the mayhem they cause. Hilda’s growing consternation is clear in her facial expressions and gestures. Kids will love Hilda’s collection of hats and matching outfits and scenes of her home. When Hilda comes home to a pristine house, the brightly colored pages turn as gray as a cloudy day. The sunny hues return with the discovery of her precious little ones, and the bedtime surprise is a delight. To learn more about Emma Chichester Clark, her books, and her paintings, visit her website. Monkeys love hanging around! Print this Just Hanging Around! 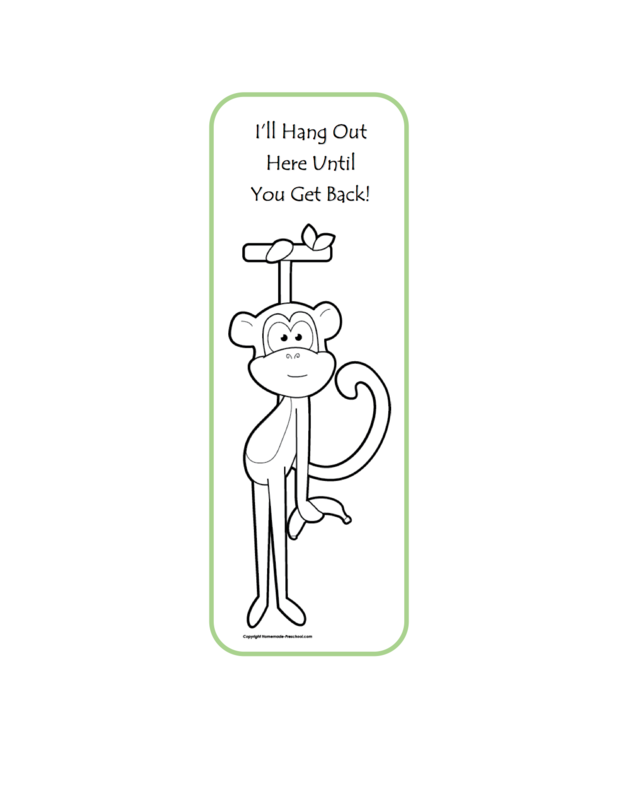 Bookmark, color it and then let this little one save your page until you come back to reading!